The yoyo loach (Botia almorhae), also known as the Pakistani loach, is a small fresh water fish native to India and Pakistan. The name yoyo loach originates from the fact that the marking on the fishes side resemble the word “yoyo”, although this becomes more difficult to see as the fish ages. In the wild, they inhabit slow flowing streams or still waters, and this environment should be replicated as closely as possibly in the home aquarium. Yoyo loaches are highly adaptable to water types and can be kept in both soft water and hard water tanks, though they should be given more time to acclimate to hard water. They will generally grow to about 5 inches (13 cm) in captivity and can live for over 20 years if they are well cared. Anyone purchasing yoyo loaches should understand that they are a long-term commitment, and most people will keep them for at least 10 years. 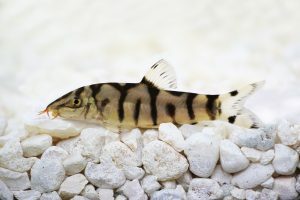 Yoyo loaches grow relatively large for an aquarium fish, and at the bare minimum should be kept in a 29 gallon (131 litres) tank while they are young. A larger tank is almost always a better choice, and they will only really thrive if provided with a 45 gallon (205 litres) or larger. They tend to be a very active and aggressive fish (to each other), so they will quickly outgrow a smaller tank. Another reason for keeping them in a larger tank, is that they are a social fish, and need to be kept in groups of at least five. If they are kept in groups any smaller than this, they will usually experience some level of stress and may begin to spend much of their time in hiding. Needless to say, a stressed out fishing in hiding is not very exciting to watch. Any tank with yoyo loaches should also contain numerous caves to give the fish a sense of security. They prefer deep caves, with small openings that allow them to squeeze their entire body into it. In fact, it’s not unusual for yoyo loaches to regularly get stuck in caves, and you should always check during a water change to make sure that none of them require rescuing. They will generally ignore any large caves or open rock enclosures that their cousins clown loaches are notorious for piling into, but there’s no reason to ignore these rock formations in a tank containing yoyo loaches. Instead of buying expensive ornamental caves, you can actually quite easily make caves at home for one tenth the price. All that is required is PVC pipe, aquarium sealant, and some rocks or sand. Using the aquarium sealant, simply glue the sand or rocks on top of the PVC pipe, and once it dries, you have a ready-made cave for your yoyo loaches. As a rule, yoyo loaches tend to be docile towards other species of fish, and aggressive fish should be avoided. That’s not to say that there won’t be some disagreements between the loaches, and often an alpha fish will become established within a complex pecking order. But they will rarely ever show any aggression to other species of fish that they share a tank with. If they are kept with an overly aggressive species fish, they quickly begin to spend much of their time in hiding. Some have been known to even go into permanent hiding and ignore food – which generally does not bode well for the health of the yoyo loach. After the aquarium has been set up and a suitable number of caves have been provided, it’s time to choose a filter. The most economical choice is usually an HOB (hang on back) filter. While a canister filter is often more effective at keeping a tank sparkling clean, it is also far more expensive and is really only required for larger, messier fish. If you need extra filtration, then a sponge filter can be used in conjunction with a HOB filter, which will help to filter the water. I would strongly recommend choosing an Aquaclear Power Filter for a yoyo loach tank. This filter combines excellent filtration with a durable design, and it will keep your tank sparkling clear for years to come. You can also read the Aquarium Tidings Aquaclear Filter Review here. Yoyo loaches are omnivores in the wild, and should be fed a similar diet in the home aquarium. Their main diet should consist of a high quality flake or pellet food, and should be supplemented regularly with live or frozen foods. I have used Hikari Sinking Wafers with great success in the past, but any sinking food will work for them. One of their favorite live foods is snails, and they will completely wipe out a tank’s snail population in a matter of days. Some other live foods they enjoy include mosquito larvae, blackworms, daphnia and brine shrimp. If you are culturing mosquito larvae for your yoyo loaches, always be sure to check local regulations, since this is illegal in many states and provinces. If live food is unavailable, then they will also relish any frozen foods that can be provided. Their favorite frozen foods are bloodworms, daphnia or brine shrimp. These should always be defrosted first, and they can easily be defrosted in a small plastic container with some warm tank water. After about 5-10 minutes in the warm tank water, they should be ready to feed to the loaches. It’s surprising that for a fish that adapts so well to life in an aquarium, that there are no confirmed reports of it breeding in captivity. There has always been the occasional claim that someone has successfully bred yoyo loaches, but at this point no accounts of breeding have been confirmed. In fact, even fish farms have had difficulty breeding yoyo loaches, and some have been experimenting with hormones to trigger breeding. At the time of the writing of this article, there were no farms that mentioned reliably breeding yoyo loaches. They are definitely not live bearers, and what you are describing isn’t too uncommon. Quite often newly hatched fry will be sucked up into the filter. If they survive the trip into the filter, then they can often live for short periods of time in the filter. You may not see any other fry, since if they aren’t protected by the filter they are often all eaten. I’ve found fry in my filter numerous times, although never Yoyo loaches. Most of the time I find bristlenose plecos in my filters. My yoyo loach rules my cichlids tank, they all move out of the way when he’s going somewhere, it sounds like mine is completely the opposite of the norm, he’s very brave and active. That’s the great thing about fish – they all have different personalities. It sounds like you have a happy and healthy loach, so keep up the good work (though he’d probably appreciate a few friends). They are egg layers, but I’m not sure of much beyond that. I’ve looked through every book and paper I have, but no one describes their reproductive methods beyond simply stating they are egg layers. I have seen my females become heavily egg laden in the past, but I’ve never seen any eggs actually laid. Let us know if you successfully breed yours though. Thanks for the info, very informative. I have a yoyo loach that is about 5 inches long. not sure of his age, but he is quite fat. He’s a very boisterous eater, wrecking plants and scaring everything in his path. Yesterday when I fed him he was more boisterous than usual, he seemed to be thrashing about recklessly and flipping from side to side, actually wearing himself out, but calmed down after a while and was ok…not nice to watch! He did it again today after feeding and so did my bristlenose! it’s starting to worry me. I am feeding a variety of food, eg flake, algae wafers, brine shrimp, shelled peas, dried bloodworms, live mosquito larvae and sinking wafers, not all at once though, maybe a combo of 3. They are in a 170ltr tank with other fish, tetras, rummynose, glass cats, dwarf gouramis, an upside down cat and rc shrimp. The water parameters are PH 7.5, am – 0, Nitrite – 0, nitrate – 5ppm. Weekly water changes with tank water. Not sure about hardness. It seems to be only at feeding time which is weird, any ideas? I’ve heard of this before, but never experienced it. From what I’ve heard, this behavior is due to a lack of hiding places in the aquarium. Do you have plenty of caves or other nooks for him to hide in? I’ve heard that they like to retreat to a hiding place after eating, and if they don’t have one, they can sometimes go nuts. If you do have hiding places, then I’m not sure. You sound like you’re providing great water conditions for it, and I’ll ask around a bit to see if I can find anything else out. I watched the video, and my money is on the fish flashing. It looks like something is irritating it, and sometimes it’s actually tied to the food. Flake foods can sometimes irritate their gills, and powder will become lodged in the gills after eating. It generally doesn’t signify anything that you should be concerned with, though I would recommend changing the food for a few days to see if the flashing stops. If it doesn’t change after you try a new food, then you may have to consider that it might be parasites. Though since the flashing only occurs after feeding, my guess is that the food is irritating the fish. I hope this helps. I also found a fry in my tank. There are only yoyo loaches in this tank. Any suggestions of how to keep it alive ? I’ve never experienced yoyo loach fry myself, so you must be doing something right. My only advice would to treat it like any other fry. Keep the water as clean as possible, offer it a variety of small foods that it can easily eat (baby brine shrimp, microworms, or crushed up flakes), and you may also want to consider getting a breeding net to keep it in. Most loaches aren’t know for eating their own species fry, but it’s better to be safe, than sorry. Thank you very much for the advice. I will try to do all it needs to survive it being large enough to fend for itself. I think the floating java moss is giving it a chance to escape. How did they go did they live? I have to admit I’ve never tried crushing up microworms before. That must be an interesting to attempt. And like you, I can’t recommend Java moss enough for any breeding tank. It provides an excellent hiding spot for fry, and a ready food source. It’s great to have it with fish fry. We have recently purchased a tank from someone and inherited the fish with it. There are two of these loaches in the tank and I have noticed that one of them has a very swollen belly, I wondered whether this could mean eggs? We received no information about these fish and it appeared as though the previous owner took little care of them as we had 4 other fish (catfish, black shark and 2x plecos) that we have since had to take to a proper aquarium due to the size of them. Plus the tank was a state when we got it. Just wondering what to do regarding the loach though, I have done some research about fish pregnancy and we have bought a birthing tank just in case. Can anyone advise? It could be from many different things, but if they were kept in poor conditions it’s mostly likely bloat. Swim bladder disorders and egg binding are relatively rare in yoyo loaches, so I would focus on treating it with antibiotics. If at all possible, I would put it in a separate tank while you treat the fish. Also, try and find antibiotic you feed to the fish, and not one where you just treat the water. I would also try to feed your fish blanched and shelled pea, which often clear up swim bladder disorders. While I don’t believe it’s that, it’s still worth trying. And finally, focus on giving it the cleanest environment possible. I would try for two water changes a week of about 10-15% each, and test the water regularly to make sure everything is withing healthy parameters. One of mine was the same way but as it grew longer, it slimmed up and it’s true that infrequent water changes can cause digestive issues. I recently considered rehoming my two 3″ yoyo loaches because they eat portions of the new leaves that grow up from some of the plants, leaving the remains torn and ragged but I had a change of heart because they are as happy as puppy dogs. So now I just want to add more types of plants that they are less likely to feed on. Any suggestions on which type of plant that might be? Some very tough (as in hard to eat) plants that thrive in almost any water conditions are anubias nana, Amazon sword plants, Java Ferns, Java moss, and hornwort (very messy though). Java ferns are really great, since it’s rare for any fish to really want to eat them, and Java moss is nearly indestructible. I have 5 yoyo loaches. Absolutely love them and their antics. And they get along amazingly well in my 60gallon hap/peacock cichlid tank. 2 of my loaches are rather robust in the body. A fair bit deeper in the girth and broader across the back then the other 3. Though their just as active and playful. Am I safe to assume those are the females? Both are very heavy in the belly right now… would they be “expecting”. One of the slimmer ones of the 5 appears to be the dominant and pretty much gets ehat ever he wants like choice of hiding space etc. I’ve never research loaches beyond compatability and care. Now I’m excited at the (although slim)possibility of babies! So I’m going to take some of the actions you guys have mentioned and hope for the best ? I have two yo-yo in my tank had them for four years now and my female has laid a bunch of eggs inside a tree log. She is very protective of the log now not letting any other fish in or near it. I’m hoping I get some to hatch. It’s a huge tank with plants and logs in it for hiding. If I get baby’s we’re can I send pictures or videos of of them to cause it would be neat if they hatched and survived. That would be amazing if they actually spawn in your tank. I’d definitely be interested in seeing pics if you can get any. I am very concerned. I purchased a yoyo loach the other day specifically because I was told they stay small and it was in to put in my 10 gallon tank. This was by the aquarium employee. I’m not sure what to do? Most stores allow you to return the fish for reasons like you mention. Though if money and space aren’t an issue, you could keep it for a short while in a 10 gallon, and upgrade it to a a proper sized tank later, and also add friends so they can school together. Hi robert. Love your tips on keeping your loach fish happy. I have had a pair of loach, for two weeks now, they are lovely to watch. I am a little concerned about one of them, he’s hiding alot, but when they feed the two of them may seem to be dancing a round together up and down the tank. This morning I noticed one was on his side and moving his fins very fast, I helped him to lay on his tummy, he swam to the top of the tank, had a little swim then flouted to the bottom again. And now he’s been there for a while up right. I have fresh plants in my tank, rocks in my tank, but no caves. I am feeding them flakes also I have live snails in my tank. What else can I do to help them, water fine. I know clown loaches sleep that way, but I can’t recall ever seeing one of my yoyo loaches doing that. I’ve seen them sleep in other weird positions that have freaked me out though – like sleeping face down in one of the caves. Are there any other signs of illness beside that? Swollen belly? Any spots that look weird? Red tip on its nose? I have 4 Yoyo loaches, they all sleep on their sides. When they first started doing it, I was sure they were dead. It still makes me crazy when they do that. I have one that is fairly large, and I assume it’s a female as her body shape is a little different and her belly is larger than the other smaller ones. I have them in a 46 gal. bowfront but am cycling a 75 gal that they will go into. I have already moved plants and rocks over to the bigger tank so there’s no hiding places for them right now. I personally, love the tank empty (of rocks and plants, lol, not water) as I can watch them play. I don’t plan on getting any more of them though, as I have pool filter sand in the new tank and would like to have some snails to help keep it aerated. They adore snails for diner. It sounds like you’re giving them a great home. I wish more people in the hobby gave them that kind of home. Hi. I have 3 yoyos,and have been keeping them in a 165 litre community tank. They are happy, active, very fat, and have voracious appetites, so I call them the three little pigs. I recently got a 400 litre tank, and yesterday moved the three little piggies over to it. They just loved it! Exploring every item and vigorously fossicking in the gravel. By evening they were doing a twisting swimming dance, the three of them intertwining. This morning they are noticeably thinner, and there are eggs plastered over all the tank walls. I guess they REALLY liked the new tank! It will be interesting to see if anything comes of them. That would be amazing if they hatch. It’s incredibly rare for them to breed successfully in the home aquarium. You’ll have to post all of the water parameters if you’re successful. Mine also are doing this dance I also just moved them into a bigger tank today (one has a huge tummy other is slim and smaller). Hope she deposits eggs so that she isn’t in discomfort. Were they recently added to the tank? Are they displaying any other symptoms? What are you water parameters right now? Hello we have a 100gallon bow front. Mostly loaches of all types, few exotic plecos . Our YoYo’s have been breeding !!! we usually do not see the babies until they are .5 to 1″ long. we find them in the tall plastic plants. It is always exciting to find the NEW GUYS !! That’s absolutely awesome. I would love to see some pictures if you have any. I have a Yo Yo that is 15+ years old. It lives in a 90 gallon tank. It is the friendliest fish I’ve ever had in my 60 years of aquariums. He loves my rather large angels due to the eggs they lay!! It is at least 5″ long and FAT! I say “it” not knowing if it is male or female. Very active and again friendly to all in the tank. You must definitely be doing something really right there. And it’s hearing stories like these that makes me enjoy running this site. I recently purchased my first Yo Yo Loach to help rid my tank of snails. He didn’t seem at all interested in snails. I don’t know if his behavior is normal, he will sometimes be on his side breathing rapidly so I’ll push him over and he’ll do this funny swim like a jerky movement. It’s going on day 6 he’s still here but not eating a lot, if the catfish see him eating, they’ll push him aside and eat so I’ve tried putting a small pellet in his hiding spot. Does he need a tank mate. First of all, how large is your tank? And have you tested your water lately? It sounds more like a water problem or illness right now. Let me know those stats, and then we’ll go from there. Hello, I have a yoyo loach problem. I have 2 of them and they were completely happy and playing 2gether, then I had an ich problem with some neons. I used half dosage bc of the loaches the ich was gone but one of the neons died and I saw a loach eating him. Then all of a sudden my one loach had a red mouth almost like lipstick. went to lfs did a water sample and they said nothing to be concerned about. They then told me to get melafix the redness has cleared up but the fish is sluggish, and constantly being chased by the other loach. i have not seen him eat and its been almost 2 weeks since i noticed he was not normal. seems as if some of his bristles are shorter then the other one. He def lays down a lot and i know he is not dead bc he keeps popping up and has gill movement. is he a goner or is there something else i can do to help him? tank is 45 gal, multiple hiding caves, other fish are tetras and dwarf neon rainbows. I’m sorry to hear about your loach. Are there any symptoms right now? Is the fish bloated or is there anything growing on him? My two yo-yos have been writhing around each other this past few days. I found this sight to see what might be the problem since I had researched and found they haven’t been proven in captivity breeders. I’m excited to see what becomes of this. Also, I’ve got to add after seeing some comments to the sleeping positions….one of mine has been named Faker due to the fact he has freaked me out sleeping on his back. Got eyeball to eyeball a few times just to have him pop us and scare the crap out of me. I inherited one with my tank and the second from a friend in the hobby that just decided she didn’t want him. They are quite entertaining. Glad to have them! But as for the breeding, some people can get them to mate, but they never seem to actually lay viable eggs. It would be amazing if you could get them breed. You’ll have to let us know if you end up with any fry. Hi Robert ! I have 4 Yo-Yo Loaches in a 8′ 250 Gallon Aquarium. I have had them since they were less than an inch in size, with me for about nine months now. I love watching them. This tank also houses 20 Discus, 100 neons and several species of Cory cats. My Yo-Yo’s always appear to be “cleaning” my Discus. The Discus are never harmed, no markings on their bodies and they don’t seem to mind it. Is this a trait of the Yo-Yo? Unfortunately, they’re probably not cleaning fish, but are most likely feeding on the slime coat. The slime coat is very important to a fish’s health, so assuming I’m right, then you should probably be concerned about their behavior. While I’ve never seen Yoyo loaches doing this, it’s very common for fish like plecos to feed on the slime coat of flat bodied fish, and having witnessed this, it’s why I think it’s occurring here. If it’s at all possible, I’d try to rehome the Yoyo loaches in another aquarium, since over time, the lack of a slime coat will open the discus up to infection. I’ve got a tank with a school of 12 aggressive penguin tetras. They’ve been in a single species tank for 6 months after proving to be too rough to house with my other fish, but without external distractions their routine squabbles inside the school have gone too far and they have been bullying the smallest member of the school to death. Today bullying victim number 3 died and I’m determined to do something to stop it from happening again. They have lots of room and cover so I think they need a larger tankmate to give them something else to think about instead of constantly squabbling – of course I only want to add a safe, peaceful tankmate, not anything that would be an actual threat. I’ve been a bit stuck trying to work out what would be suitable. The tank is planted so I don’t want a barb species that will trash my plants or a cichlid that will dig them up. Gouramis and angels would likely have their trailing fins nipped off in no time so they’re out too. Someone suggested to me that yoyo loaches might be a good match so I have been researching them and I really like what I see. I think the parameters I keep my tetra tank at match the requirements for yoyo loaches, plus the tetras stay in the top third of the tank and won’t chase any food that falls over the half way mark so their territories hopefully won’t overlap too much, and it would be nice for this food not to be wasted, not that I would consider a bottom dwelling fish to just be a tank cleaner. There are a ton of snails (clean up crew for the fallen food) and I already have sinking catfish food, worms, and so on so I won’t need to change much to keep them well fed. The tank has peagravel with plants along the back and fine sand in the front half, with a few lumps of driftwood and smooth stone. I gather its probably not enough cover to satisfy a loach but I have PVC pipe I can add if necessary, and there is a very shady hollow under one of the driftwood pieces. So my concerns are, will yoyo loaches be able to shrug off any rude behaviour from these tetras? I wouldn’t want them to get too bashed and bullied. The other issue is that my tank is only 4 feet by 14 inches deep by 16 inches tall, which I think is around 180lt and I’m a little worried this might be a touch small for a group of six adult sized loaches. Sadly I can’t find any zebra loaches in my region as I think they are a bit smaller and might fit better. I’d rather try a big group than skimp and only get 3 or 4 as I want them to grow up happy, and I don’t intend to add any other fish. Do you think yoyo loaches could be happy in my tank? While adding bottom dwelling fish will likely not cause any problems, it also won’t solve your aggression issues. One of the best pieces of advice I can give is to use tall ornaments and plants to break your tank up into distinct regions. Once lose line-of-sight with another fish, the aggression often ends. I have used this successfully in many of my more aggressive tanks, and some are split up by rock formations, or tall and floating plants. As for the choice of fish, your tank should be large enough for yoyo loaches. But catfish would also work just as well, and you wouldn’t be pushing the limits like you would be with a full yoyo loach. I purchased a yoyo a couple of months back and it has killed off my snails but also my panda corys which I loved But he is now happily living aside my other fishes in my 60 litre tank and I am rather fond of him now. I’m sorry to hear about your panda corys, but even if they can be a bit mean, these are really great fish. It’s hard not to get attached to them. How did they look before they died? Any bloating? Any weird behavior? I wouldn’t worry too much about it. Fish take a while to get used to their new surroundings. They should calm down after a day or two. Hi, I was wondering if I could keep young yo-yo loaches in a 29 for a year with a blue gourami? As long as they’re not too small, they will do fine with a blue gourami while they grow. But you’ll need to upgrade their tank in the future. They are pretty notorious for hiding, but the aquarium is way too small for them. And do you know what killed your yoyo loach? Was it another loach? It sounds like they would be better in 30 gallon if at all possible. Hi there, I have a 4yr old yo-yo in a community tank. I’m moving to a 175l tank and would like to give him a couple of friends. I’ve only found juvenile ones though and my existing one is quite big. Can I add or do you think there will be issues. Generally speaking, different sized yoyo loaches mix quite well together. I’ve seen many small yoyo loaches being kept with much larger yoyos, so you shouldn’t have any problems. I would just keep an eye out for any aggression – not usually a problem with yoyo loaches, though there can be some dominance issues when kept in larger groups. I’ve had a my loach nearly 18 years has lived in a cold water tank with Black Moor, for the last 5 years doesn’t really bother them much just chases them occasionally. Just hides away and minds it’s own business, still fairly active at night. Always made sure it has somewhere it can hide it loves tiny small spaces to hide in.